Britain, 6th century AD…a place of Pagan magic and Christian piety, a place of mystery, treachery, and dark enchantment. 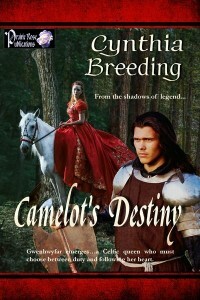 Here the legend of Camelot is born and, with it, bold passions and forbidden desire. Young, lovely, and willful, fiery-tempered Gwenhwyfar is chosen by Arthur to be his wife and queen…an honor she reluctantly accepts. Soon, however, she cannot ignore the awakening passion Britain’s new king ignites. He is a lover who delights her with his touch, yet whose desires are not shared with her alone. Seared by the forbidden kiss of Arthur’s most-trusted warrior, Lancelot, Gwenhwyfar is swept into a world of passion, torn by loyalty and love to a husband who betrays her and a man she cannot have. But in a time where good and evil clash, where magic and chivalry reign, love will prove a weapon as powerful as any sword.